Love to sing? We do! Join us! 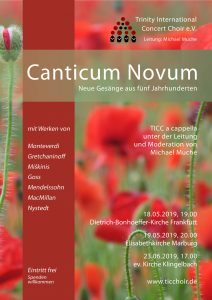 » more - mehr... "About us"
» more - mehr... "Spring 2019 – Canticum Novum"
» more - mehr... "Rehearsals"
A musically broadening a cappella delight brought to you by TICC under the direction and moderation of Michael Muche. Admission free – donations are welcome. Our program combines two things: the joys of sacred choir music and new worlds of sound! From the very old to the very new, from the late Renaissance on into the 21st century: TICC is offering a uniquely composed program. The concert’s unifying theme is the sacred song of praise. 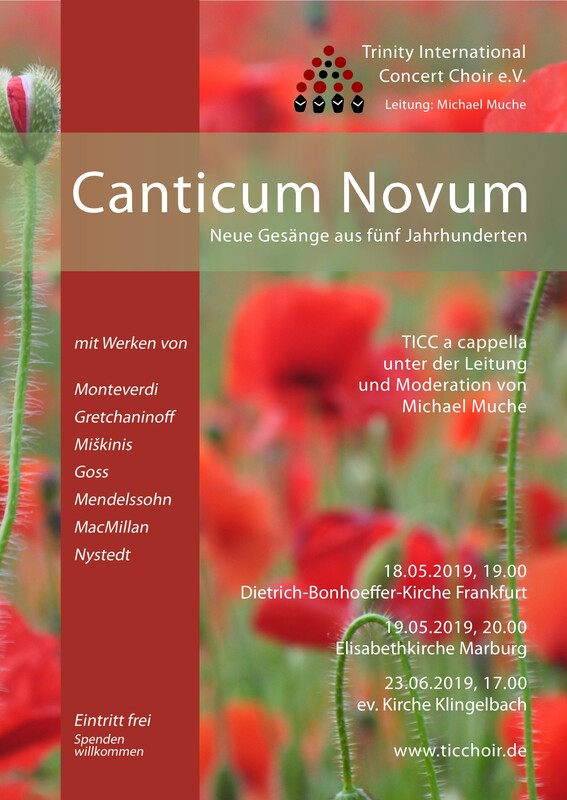 Seven representative a cappella works from Monteverdi to Mendelssohn-Bartholdy to Nystedt have been chosen for this musical stroll through the centuries. Our director has chosen the lecture recital format to provide an intellectual framework for the emotional intensity engendered by these works. The performance of each work is preceded with an entertaining introduction and illustrated by the singing of selected passages by the choir. The advantage of this “sung music lesson” is that in addition to getting acquainted with some relatively unknown composers the audience will gain an understanding of why many of them were regarded in their time as musical revolutionaries and historically important composers. Claudio Monteverdi (1567-1643) for example. He is the bridge between the Renaissance to the (early) Baroque era. What for his contemporaries were genuinely disquieting and daring harmonic acrobatics are perceived today as totally melodious: the comfortable familiarity of a golden oldie. The second part of the program is designed to give the audience precisely that experience with the new or unfamiliar. The very influential Norwegian composer Knut Nystedt challenges today’s listener expectations just as Monteverdi did in his time. Nystedt, who died in 2014, marries the craftsmanship of 20th century composition with aural sensuality – instead of glaring dissonance the audience is treated to a delicious musical setting with highly inventive and surprising changes in direction. In this regard his fascinating “All the Ways of a Man” (1971) might almost be viewed as a compendium of modern compositional technique. Intercultural understanding through sacred and secular choral music! The experience of working together on demanding and fulfilling music unites us. We offer a musical home for people from all over the world living temporarily or permanently in the Rhine-Main region. The Trinity International Concert Choir (TICC) e.V. began as “The Messiah Project” in 2011 and has since established itself in Frankfurt as a uniquely international choir. Concert programs in recent years have included Handel’s Messiah, Bach’s St. John Passion, Dvorak’s Mass, Fauré’s Requiem, Bilder der Hoffnung (paintings of hope) by Petr Eben, Rossini’s Petite Messe solennelle, Mozart’s Requiem in the version by Robert D. Levin and, most recently, Telemann’s Day of Judgment. TICC rehearses at the Trinity Lutheran Church in Frankfurt, an international, English-speaking parish whose former musical director, Dr. Jerrode Baker Marsh, was the impulse and guiding inspiration for the choir. Frankfurt’s multicultural society is reflected in the composition of the choir: currently about 60 singers from 13 different nations sing together. At Christmas, we usually present mixed programs of Advent songs and carols from our members’ home countries. After single-handedly organizing the choir for its initial project performances of “Messiah” and then building and directing it afterwards, in 2015 Dr. Jerrode Baker Marsh passed the baton to our current director, Michael Muche. Michael Muche has a particularly close affinity with choral music. He grew up in a family of church musicians and started singing in choirs at a very early age. He learned to play the piano and the violin, took singing lessons and was a member of various orchestras and bands. The time he spent as a chorister in the Nordhessischer Kammerchor and the Kammerchor St Jacobi in Göttingen was particularly influential in determining his later course in life. He holds a degree in conducting from Dresden University of Music, where he studied with Professor Leißner and Professor Rademann. As part of his studies, he worked with professional orchestras such as the Saxon State Theatre Orchestra and the Erzgebirge Philharmonic in the town of Aue. He gained his first experience of opera productions in the University’s opera class, conducting, for example, Britten’s “The Turn of the Screw”. While still a student, Michael Muche worked as the musical assistant of the Dresden Youth Symphony Orchestra and conducted the Werkstattorchester Dresden. He was also the musical director of the ecumenical choir of the Weinbergskirche in Dresden, where he conducted performances of Britten’s “Saint Nicolas Cantata” and Brahms’ “Liebesliederwalzer”. After his graduation, Michael Muche was invited to work as the musical assistant at the Thuringia Castle Festival in Sondershausen. 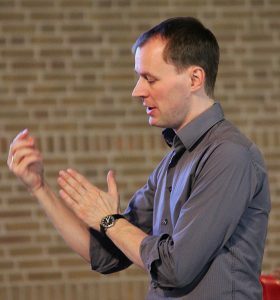 He has been teaching choral conducting at the Centre for Advanced Training in Sacred Music in Schlüchtern since 2012 and also works with the university orchestra in Gießen as its musical assistant. In June 2015 he was appointed as the new musical director of Trinity International Concert Choir, Frankfurt. He conducted the Marburg Chamber Orchestra, was the musical director in the production of Loewe’s oratorio “Jan Hus” with the Marburg Octet and conducted the world-premiere of ”Passio vitae II“ (Conrad Misch) with the choir Cantate Domino, Frankfurt. Current engagements have taken him to the Ringkirche in Wiesbaden as conductor of the children’s choir and orchestra, among others. Especially the cooperation with Wolfgang Schäfer, Stefan Ottersbach and Matthias Mensching had a strong influence to his work.